On this date in 1591, Agnes Sampson, the “Wise Wife of Keith”, went to the stake at Edinburgh during the North Berwick Witch Trials. Perhaps Scotland’s most notorious witch hunt, the 1590-1591 sweep caught up something approaching 70 supposed sorcerers thanks to the king’s security panic after dangerous North Sea storms had beset the sea voyages uniting King James VI of Scotland and his new wife Queen Anne of Denmark. An inquisition in Denmark had made witches the culprit, and the young James — amusingly described by one commenter as “a superstitious and distrustful poltroon”* — opened an inquiry of his own as soon as he returned to native heather. His subsequent obsession with witchcraft is one of the signal characteristics of his reign, immortalized in literature via Shakespeare’s Macbeth. In an illustration from Daemonologie, James personally interrogates witches. A woman named Geillis Duncan, maid to the deputy mayor of a small town near Edinburgh, was the fountainhead of the the North Berwick trials, when her suspicious master tortured her into admitting to witchcraft. King James personally joined the ensuing interrogations which saw her denounce several dozen Edinburghers as fellow necromancers, among them our day’s principal — a matronly widow named Agnes Sampson, who was a respected “wise woman” and folk healer much in demand among Edinburgh’s elites. We’re quoting here the 1591 pamphlet Newes from Scotland, one of the key primary sources (and justifications) of the witch trials which was issued from a pen very near to the king’s own hand. Having endured the cruel torture of having her hair wrenched (“thrawn”) by ropes for an hour, Newes from Scotland reports, Sampson broke down when an incriminating wart was discovered upon her bared pudenda. the said Agnis Tompson confessed that the Divell being then at North Barrick Kerke attending their comming in the habit or likenes of a man, and seeing that they tarried over long, he at their comming enjoyned them all to a pennance, which was, that they should kisse his Buttockes, in signe of duetye to him: which being put over the Pulpit barre, everye one did as he had enjoyned them: and having made his ungodly exhortations, wherein he did greatlye enveighe against the King of Scotland, he received their oathes for their good and true service towards him, and departed: which doone, they returned to Sea, and so home againe. At which time the witches demaunded of the Divel why he did beare such hatred to the King, who answered, by reason the King is the greatest enemy he hath in the worlde: all which their confessions and depositions are still extant upon record. Item, the saide Agnis Sampson confessed before the Kings Majestie sundrye thinges which were so miraculous and strange, as that his Maiestie saide they were all extreame lyars, wherat she answered, she would not wishe his Maiestie to suppose her woords to be false, but rather to beleeve them, in that she would discover such matter unto him as his majestie should not any way doubt off. And therupon taking his Majestie a little aside, she declared unto him the verye woordes which passed betweene the Kings Majestie and his Queene at Upslo in Norway the first night of their mariage, with their answere eache to other: whereat the Kinges Majestie wondered greatlye, and swore by the living God, that he beleeved that all the Divels in hell could not have discovered the same: acknowledging her woords to be most true, and therefore gave the more credit to the rest which is before declared. One can see the work this tract — circulated as its title implies in England, where James was already being set up to inherit rule from the aging Queen Elizabeth — effects as propaganda: James as “the greatest enemy [the Devil] hath in the worlde”; James as the savvy and thorough interrogator too worldly to be taken by Agnes Sampson’s crazy stories until she proved them with a conveniently unfalsifiable private conference. Definitely no superstitious poltroon! Why, it was only by his superlative faith that James earned the divine favor required to overcome his adversaries’ weather machinations. She confessed that she tooke a blacke Toade, and did hang the same up by the heeles, three daies, and collected and gathered the venome as it dropped and fell from it in an Oister shell, and kept the same venome close covered, untill she should obtaine any parte or peece of foule linnen cloth, that had appertained to the Kings Majestie, as shirt, handkercher, napkin or any other thing which she practised to obtaine by meanes of one John Kers, who being attendant in his Majesties Chamber, desired him for olde acquaintance betweene them, to helpe her to one or a peece of such a cloth as is aforesaide, which thing the said John Kers denyed to helpe her too, saying he could not help her too it. And the said Agnis Tompson** by her depositions since her apprehension saith, that if she had obtained any one peece of linnen cloth which the King had worne and fouled, she had bewitched him to death, and put him to such extraordinary paines, as if he had beene lying upon sharp thornes and endes of Needles. Moreover she confessed that at the time when his Majestie was in Denmarke, she being accompanied with the parties before specially named, tooke a Cat and christened it, and afterward bound to each parte of that Cat, the cheefest partes of a dead man, and severall joynts of his bodie, and that in the night following the saide Cat was conveied into the midst of the sea by all these witches sayling in their riddles or Cities as is aforesaide, and so left the saide Cat right before the Towne of Lieth in Scotland: this doone, there did arise such a tempest in the Sea, as a greater hath not beene scene: which tempest was the cause of the perrishing of a Boate or vessell comming over from the towne of Brunt Iland to the towne of Lieth, wherein was sundrye Jewelles and riche giftes, which should have been presented to the now Queen of Scotland, at her Majesties comming to Lieth. Againe it is confessed, that the said christened Cat was the cause that the Kinges Majesties Ship at his comming foorth of Denmarke, had a contrary winde to the rest of his Ships, then being in his companye, which thing was most strange and true, as the Kings Majestie acknowledgeth, for when the rest of the Shippes had a faire and good winde, then was the winde contrarye and altogither against his Majestie: and further the saide witche declared, that his Majestie had never come safelye from the Sea, if his faith had not prevailed above their ententions. Moreouer the said Witches being demaunded how the Divell would use them when he was in their company, they confessed that when the Divell did receive them for his servants, and that they had vowed themselues unto him, then he would Carnallye use them, albeit to their little pleasure, in respect of his colde nature: and would doo the like at sundry other times. The History of Witchcraft podcast does a deep dive on the North Berwick trials in episode 9 which indulges detail (from about 25:40) on the logistics of witch-burning executions. This episode is part of a whole series on witchy King James that also compasses episodes 7, 8, and 10. * Ray Defalque and A.J Wright, “In the Name of God: Why Agnes Sampson and Eufame McCalyean were burned at the stake” in Bulletin of Anesthesia History, July 2004. The interest in the case from this unusual-to-Executed Today source is that the charges against Sampson included those of witcherous midwifery, to wit, “remov[ing] Lady Hirmestone’s pain and sickness the night of her labor” and doing the same for Eufame McCalyean. As a result, “several authors have suggested that obstetrical analgesia started in Edinburgh in 1591,” an interpretation that Defalque and Wright, both anesthesiologists, reject. ** Newes from Scotland puts this part of the confession into the mouth of a more historically elusive woman called “Agnis Thompson”: many scholars believe that Sampson and Thompson are the same person. If there’s one thing King James VI of Scotland (eventually to also become James I of England) worried a lot about, it was witches. Whatever it was, King James had it in spades. The son of one executed monarch and father of another, James kept head tightly fixed to shoulders all his own days, and he used it to write the (well, a) book on witch-hunting. THE fearefull aboundinge at this time in this countrie, of these detestable slaues of the Deuill, the Witches or enchaunters, hath moved me (beloued reader) to dispatch in post, this following treatise of mine, not in any wise (as I protest) to serue for a shew of my learning & ingine, but onely (mooued of conscience) to preasse / thereby, so farre as I can, to resolue the doubting harts of many; both that such assaultes of Sathan are most certainly practized, & that the instrumentes thereof, merits most severly to be punished: against the damnable opinions … not ashamed in publike print to deny, that ther can be such a thing as Witch-craft. You couldn’t fault the guy for a lot of daylight between his principles and his practices. With a deft political touch, Shakespeare wrote Macbeth after James ascended the English throne as James I. In 1589, Jamie sailed to Denmark to wed a Danish princess. When ferocious storms nearly wrecked the royal convoy on its return trip, there was only one possible explanation: witchcraft. And security theater for 16th century Scotland wasn’t taking your shoes off when ferrying across the nearby loch — it was publicly burning human beings to death for consorting with the devil. 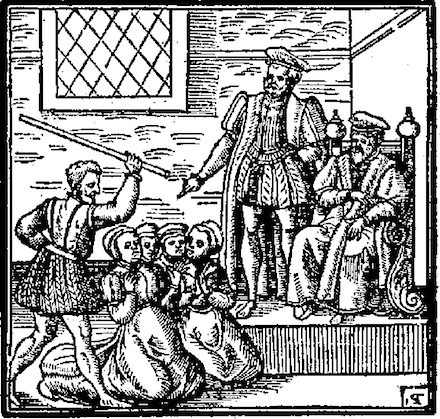 So once the king made it back home, he initiated the North Berwick Witch Trials, the first notable witch-hunt of his reign. Our day’s principal, whose name has various different renderings (such as Eufame Mackalzeane), was the last to suffer for some months. Euphan McCalzeane was a lady possessed of a considerable estate in her own right. She was the daughter of Thomas McCalzeane, lord Cliftenhall, one of the senators of the college of justice, whose death in the year 1581 spared him the disgrace and misery of seeing his daughter fall by the hands of the executioner. She was married to a gentleman of her own name, by whom she had three children. She was accused of treasonably conspiring of the king; of raising storms to hinder his return from Denmark; and of various other articles of witchcraft. She was heard by counsel in her defense; was found guilty by the jury, which consisted of landed gentlemen of note; and her punishment was still severer than that commonly inflicted on the weyward sisters; she was burned alive, and her estate confiscated. Her children, however, after being thus barbarously robbed of their mother, were restored by act of parliament against the forfeiture. The act does not say that the sentence was unjust, but that the king was touched in honour and conscience to restore the children. But to move the wheels of his majesty’s conscience, the children had to grease them, by a payment of five thousand merks to the donator of escheat, and by relinquishing the estate of Cliftonhall, which the king gave to sir James Sandilands, of Slamanno. Like any number of other executed “witches,” this one professed innocence at the scaffold.